When my generation was younger we’d go to a concert and buy a t-shirt. We were in a sense walking billboards sharing that we went and have proof. There are some things that shouldn’t be billboards though, right? I’ve been thinking and researching a lot about how kids think about social media. Unlike the the concert t-shirt that was displayed when I chose to wear it, social media platforms enable users to share instantly with a wide audience. While the t-shirt fades, shrinks or tatters – once something is shared online, it really is a part of your permanent record. Eek! “Around the time of puberty” is exactly when many kids are diving head first on social media platforms. Impulses, which tend to have us toss caution to the wind and instant gratification surfacing in a form of “likes” in combination with the development of the mind make way for a perfect social media storm. Think of what it was like growing up in the 80s or 90s and how social media has complicated “growing up.” Social media didn’t exist to broadcast our less than stellar decisions where we had to live them over and over again. For instance, we no longer live in a world where if a picture is taken we can rip it up, destroy the negative and be done with it. This all the more reason to engage in a conversation about our actions and behaviors on social platforms. We also need to acknowledge that our use and intentions of social media, like the use of cell phones, varies from our kids perspectives. There are some things that we should think twice about before posting- especially in cases when we post to prove to something. What exactly are we trying to prove and to who? Sometimes the more we try to convince others, the more our own insecurities are revealed. You guessed it… this post doesn’t just apply to kids. Do I have something to prove? Do I have permission to share? Will it make someone uncomfortable? Will it start an argument? Is this post about payback? Would I say it in a room full of people? Is there a possibility I will regret it? Would I post it if my parents, children, teachers, partner or boss could read it? We’ve entered into a season where peoples lives are an open book, posted one status at a time even sharing in the past tense while expressing in the present. Our conversations need to look beyond online safety. Our conversations need to pivot to digital footprints, legal repercussions and minding our manners on social platforms. This also means knowing when to STOP engaging with others online. 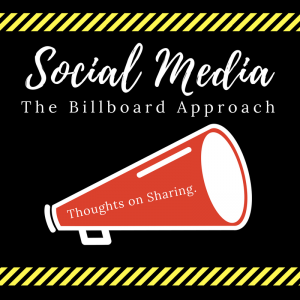 Social media platforms are like billboards representing each user. They are a reflection of who we are, want to be and how others view us. Keep in mind colleges and potential employers search your social media profiles. Students have gotten in trouble and even expelled over social media posts along with people being fired from jobs. By thinking in terms of the Billboard Approach, we might be more selective about what we share and who has privilege to that information. My Marriage. Successful, meaningful relationships that are filled with heart aren’t nurtured online. I’ll share my accolades with the one who it matters to. Passive aggressive posts. I just don’t want to toss that out into the universe. Other peoples kids (sharing pictures without permission) whether it be from a playdate, working with them at school or something I witnessed. Posts that may make others feel excluded. I try to post with heart. #Blessed. I never want to show gratitude under the disguise of being boastful about something. What are some things that are off limit to you? This entry was posted in Uncategorized and tagged #socialmedia #digitalcitizen #parents #teachers #teens by beverly. Bookmark the permalink.